Doncaster secured back-to-back wins in League One for the first time this season with victory at Blackpool. Andy Williams capitalised on an early defensive error from Charles Dunne to score his fourth goal in three games. Nathan Tyson then volleyed over for the visitors before Mark Cullen glanced a header wide for the Tangerines. 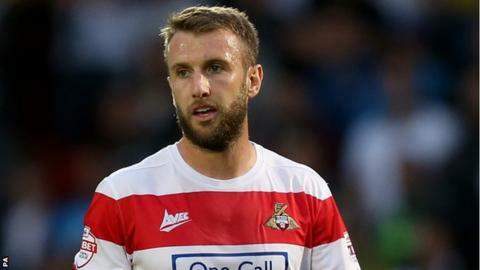 Aaron Taylor-Sinclair tapped home following a corner to deservedly make it 2-0 before the break and Doncaster eased to victory. Match ends, Blackpool 0, Doncaster Rovers 2. Second Half ends, Blackpool 0, Doncaster Rovers 2. Charles Dunne (Blackpool) wins a free kick on the right wing. Foul by Cameron Stewart (Doncaster Rovers). Harry Middleton (Doncaster Rovers) wins a free kick in the defensive half. Corner, Doncaster Rovers. Conceded by Clark Robertson. Attempt blocked. James Coppinger (Doncaster Rovers) right footed shot from outside the box is blocked. Attempt missed. Andy Williams (Doncaster Rovers) right footed shot from outside the box is too high. Attempt missed. James Coppinger (Doncaster Rovers) right footed shot from outside the box is high and wide to the right. Attempt missed. Mitchell Lund (Doncaster Rovers) right footed shot from outside the box is high and wide to the right. Attempt missed. Andy Williams (Doncaster Rovers) right footed shot from the left side of the box misses to the right. Corner, Blackpool. Conceded by Andy Butler. Foul by Cedric Evina (Doncaster Rovers). Attempt saved. Andy Williams (Doncaster Rovers) right footed shot from the centre of the box is saved in the centre of the goal. Attempt missed. Clark Robertson (Blackpool) header from the centre of the box is close, but misses the top left corner. Corner, Blackpool. Conceded by Conor Grant. Attempt blocked. Tom Aldred (Blackpool) header from very close range is blocked. Substitution, Blackpool. Martin Paterson replaces Jack Redshaw. Substitution, Doncaster Rovers. Keshi Anderson replaces Nathan Tyson. Substitution, Doncaster Rovers. Craig Alcock replaces Felipe Mattioni. Kwame Thomas (Blackpool) wins a free kick in the defensive half. Attempt saved. Andy Williams (Doncaster Rovers) left footed shot from the centre of the box is saved in the bottom left corner. Attempt saved. Mark Cullen (Blackpool) header from the centre of the box is saved in the centre of the goal. Attempt blocked. Mark Cullen (Blackpool) header from the centre of the box is blocked. Substitution, Blackpool. Kwame Thomas replaces Jarrett Rivers. David Ferguson (Blackpool) wins a free kick in the defensive half.